SAN JORDI- FOR SALE. 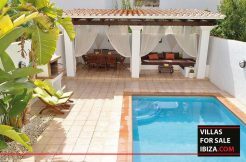 This 486 sqm villa comes with 6 beds and 7 baths spread across 2 floors. On the ground floor there is a large living room (50 m2), dining room (27 m2), kitchen, two bedrooms, one with en suite bathroom, toilet and laundry. Dining room has huge windows with views of the garden and the large porch. On the first floor there are three further bedrooms, all with en suite bathrooms. Two of them have a small built-in kitchen. Some rooms have terraces. On the lower floor there is an independent apartment with its own kitchen, bedroom and living room. There is also a large country-style lounge with kitchen, barbecue and fireplace. In addition there is a parking for four vehicles. 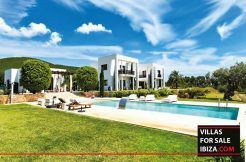 The villa has a beautiful 1,004 m2 garden with mediterranean plants, it is fully fenced and has a nice pool with a waterfall.